Great for St. Patrick's Day celebration. And easy to make. Also fun since you can be drinking extra Guinness as you're baking. Source for this recipe is http://www.foodnetwork.com/recipes/chocolate-stout-and-irish-cream-liqueur-cupcakes-recipe.print.html. Preheat the oven to 325 degrees F. Line a cupcake or muffin pan with 24 regular-size cupcake liners. Place the stout and butter in a medium-size saucepan and whisk together on medium heat until the butter is melted. Remove from the heat. Sift the cocoa powder into a medium-size bowl and add the sugar. Slowly whisk into the stout mixture. In a small bowl, combine the sour cream, eggs, and vanilla and lightly whisk until smooth. Add this mixture to the saucepan and whisk thoroughly (it may appear lumpy). Sift the flour and baking soda together in another small bowl and then add it to the saucepan, mixing a final time until the color is even. Fill the cupcake liners three-quarters full with batter and bake until the cakes spring back after touching, about 27 minutes. Cool the cupcakes in their pan for 5 minutes before transferring to a cooling rack. To assemble: Pipe the frosting onto cooled cupcakes using a large plain tip. Dust with cocoa powder if preferred. Cream the butter in the bowl of an electric stand mixer until pale. Turn the mixer to low speed and add the Irish liqueur in a steady stream. Slowly add the confectioners' sugar and continue beating until a creamy consistency is achieved. 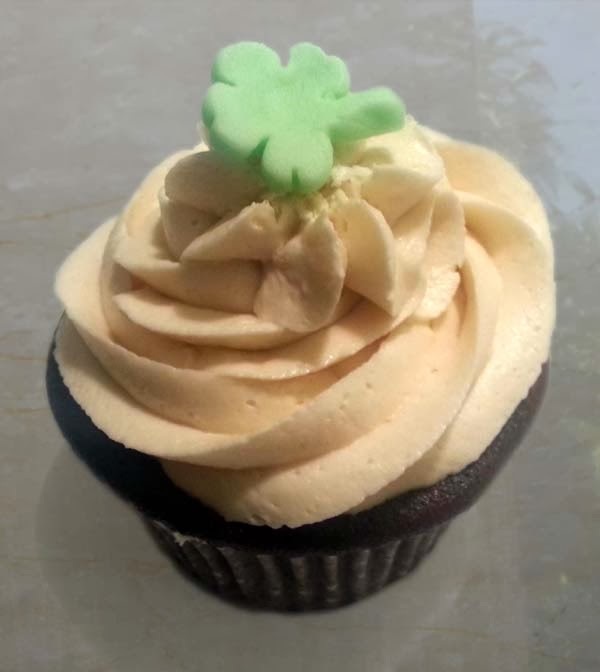 For another Guinness recipe, see this one for a carbomb cake.